John Buck’s 1880 death certificate wrongly recorded his age as 64, and as a result some sources have identified him as a John Buck born in London in 1816. However, Census returns for 1841 to 1871 inclusive all indicate that he was born in 1819 and give his birthplace as Burnham Market, near King’s Lynn, Norfolk. At the time of the 1841 Census he was a 22 year old medical student living in lodgings in White Street, St. Giles Cripplegate, London. This address is very close to St. Bart’s Hospital which had been officially recognised as a medical school in 1824, so it seems most likely that he was studying at Bart’s at the time. He came to Leicester soon afterwards, initially as an assistant to Dr. Thomas Macaulay, cousin of the historian and Whig politician Thomas Babington Macaulay, who was a surgeon in private practice, surgeon to the Leicester Infirmary and medical officer to the Leicester Poor Law Board. In October 1846 Buck and Dr. John Barclay (Lit and Phil President 1857-58) were appointed by the Corporation joint part-time medical officers under the new Nuisance Removal Act at an annual fee of 20 guineas each, and following the adoption by the Corporation of the first Public Health Act in 1848 Buck and Barclay were appointed the first Medical Officers of Health under the Act at a salary of £100 a year each. There were immediate improvements in the sanitary conditions of the town, and the 1848-49 cholera epidemic, which killed over 50,000 nationally, did not result in a single death in Leicester. Both Medical Officers of Health took on very heavy workloads: in their first year, October 1848- October 1849 alone they investigated over 2000 “foul and offensive and badly constructed privies and soil pits, filthy dwelling houses, swine keeping, foul and offensive drains, foul cesspools and ditches” and various other nuisances and brought 465 prosecutions under the Act. The Medical Officers pressed for the building of sewerage and fresh water systems for the whole of the town, the provision of public baths and wash houses, modern housing including a ban on the building of back-to-backs, and the removal from the town of particularly offensive trades – in particular that the many backyard slaughter houses should be replaced by a completely new cattle market and public abattoir. Over the next two decades all of these were to be achieved. Buck quickly moved to reform both the treatment of the patients, immediately reforming their harsh prison-like treatment and restraint. 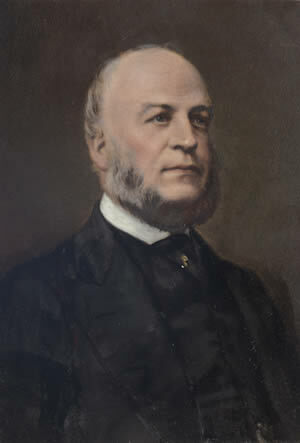 At the same time he persuaded the Commissioners for Lunacy to build a number of new buildings including a wash house, bakehouse, workshops and farm buildings which were all to be used to for both servicing the Asylum and at the same time providing a wide range of occupational opportunities for the inmates. Other new buildings included a Chapel and a Recreation Hall, and Buck also introduced musical entertainments and formed a brass band among the inmates. He organised frequent excursions outside the Asylum for groups of 10 to 20 patients accompanied by staff, with excursions being into the Leicestershire countryside including local villages, Leicester Forest and Bradgate Park (then still privately owned), while there was even an day excursion by train to London for 11 patients to visit the Crystal Palace in 1856. Amelia died in Leicester in 1868, and the 1861 and 1871 Censuses record the widowed Buck as living in the Asylum, but in 1872 he was provided with a purpose-built Superintendent’s House adjacent to the Asylum site. He died while still in office early in 1881 at the age of 61. Sources: England and Wales Censuses 1841 – 1871; Births, Marriages and Deaths Registers; Orme, H.G. & Brock, W.H., 1987. Leicestershire’s Lunatics: the institutional care of Leicestershire’s lunatics during the nineteenth century. (Leicester: Leics. Museums Publication no. 87); Elliott, M., 1990. John Buck: Pioneer of Preventive Medicine and the Care of the Mentally Ill. Trans. Leics. Archaeol. & Hist. Soc. vol. 64, pp. 57 – 61. Archives: Buck’s papers and Notebook are deposited in the Record Office for Leicestershire, Leicester and Rutland, Wigston, Leics. (ref. DE 3533).